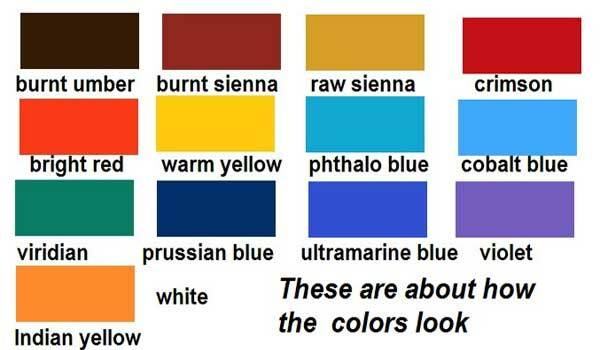 I will explain the colors so as for you to know which colors to use. The simple way to get started is to buy one color and white. – Burnt umber and white. In acrylics just use white or blank. Colors needed to paint in full color. White (and plenty of it) burnt umber. burnt sienna, raw sienna, crimson, bright red, warm yellow (like the color of an orange – not a lemon), phthalo blue and cobalt blue. That is the basic names for a set of paints. Other colors you can use are viridian (green) or phthalo green, Prussian blue. Ultramarine blue, violet, Indian yellow (Australian sienna or Australian red gold). Beginners should read this ‘tips’ page. Brushes I use are a 1 inch house painting brush, 2 inch house painting brush, fan brush, large (about 15mm ferrule) round hog bristle brush, flat (about 15mm) hog bristle brush, small soft hair brushes (for the twigs) and a cranked painting knife.